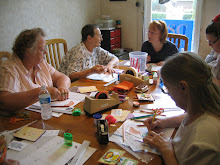 Because the "Christmas in July" card-making class was such a hit and overflowing with people, I have added another session to the "2nd Revised August Calendar". The card class (with pizza) was initially scheduled only on Sunday, August 7, from 12:00 - 5:00pm (for $30), but will now also be offered on Monday, August 22, from 10:00am - 2:00pm (with no pizza, so bring your own lunch, for $25). Class size will be limited to EIGHT (I learned I am too old to be running from room to room), but the card selection options will continue to grow and change. What a fun way to get ready for the holidays...check it out and register early if you would like to attend! !